In May 2015, the city of Detroit will start shutting off water to 28,000 people. Last summer, the Blue Planet Project worked with the Detroit People’s Water Board and Food and Water Watch to sound the alarm on the city’s plans to shut off water to thousands of Detroiters. The Detroit Water and Sewerage Board’s shameful strategy of punishing poor people who could not afford exorbitant water rates by shutting off their water garnered media attention throughout the US and around the world. UN experts declared it to be a violation of the fundamental rights of people living in Detroit. As a result of public pressure within the city and solidarity from people around the world, the water shut-offs stopped temporarily and the city promised plans to address the needs of the poor. But nearly a year later, the city of Detroit and state of Michigan have done little to support poor people lacking access to basic services. In May they will ramp up their public relations efforts as they forge through with a plan to cut off tens of thousands of people from their water and sewerage services. Their communication strategy is to blame poor families by referring to unpaid bills as “theft” and by pointing the finger at a “culture of irresponsibility”. Given the racialized nature of poverty in the city, this PR strategy is a thinly veiled racist attack on Detroit’s poor black families. The Detroit People’s Water Board is launching a telephone campaign in response. 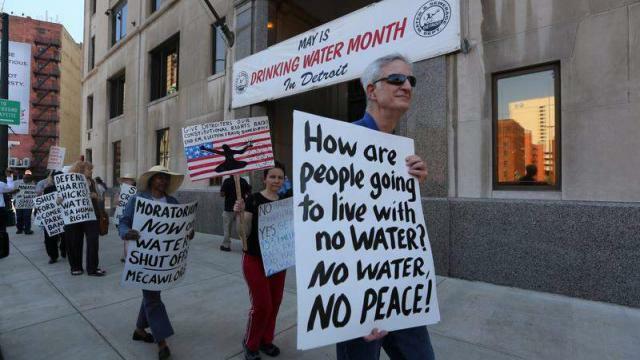 Tell Detroit & Michigan to turn the taps back on: Water is a human right! Join the national call-in days and demand that Michigan Governor Rick Snyder & Mayor Duggan end the water shutoffs, restore water to all residents and implement the People's Water Affordability Plan.